Great machine have been using it a couple weeks now. Very happy with purchase. 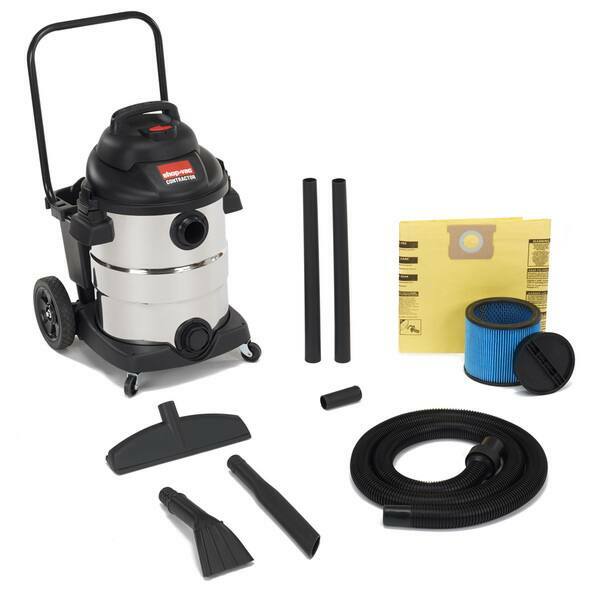 Shop-Vac 10 Gallon stainless steel 6.5 peak HP wet/dry vac includes a 12 foot x 1.5-inch LockOn hose, two 1.5-inch extension wands, 14-inch floor nozzle, 16-inch crevice tool, claw utility nozzle, Ultra Web cartridge filter, high efficiency disposable filter bag. This vac is powerful! We handle most of the upgrades in our home and this shop vac really comes in handy. The attachments are great too. We are glad to have the stand that comes with wheels in order to move the shop vac around with ease. I love this shopvac! It is great to do indoor and outdoor work. Has great suction and picks up anything! I clean up leaves, sawdust, nails *nd just about anything else with this great products!! I would highly recommend this!